When visiting a city for the very first time, your hotel’s location is pretty integral. It can make or break your first time stay. 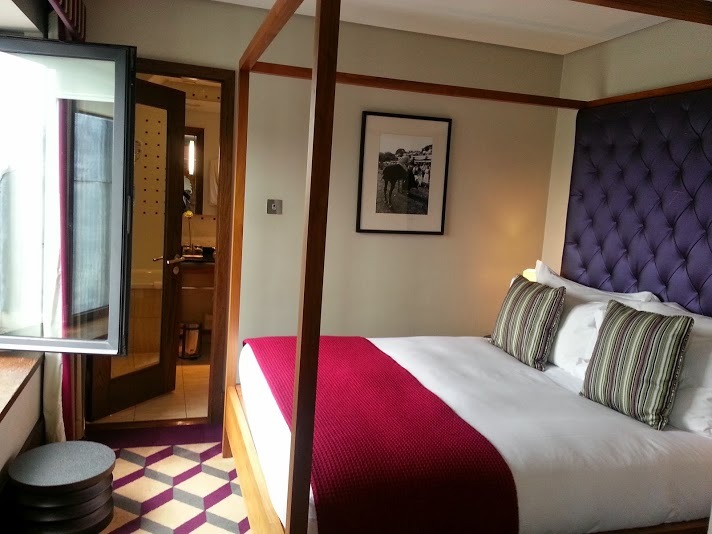 And so it was my fortunate luck that on my first night in Dublin, a city I’d never been to before, I was checked in at the Fitzwilliam Hotel Dublin. 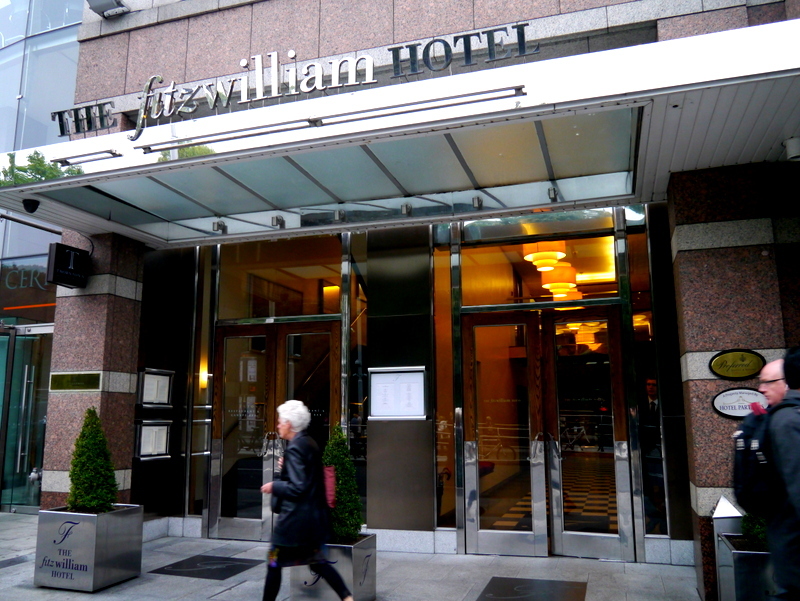 The Fitzwilliam Hotel in Dublin: Location is key. A member of the Preferred Hotel Group, The Fitzwilliam Hotel Dublin is a 5-stay boutique luxury property whose location cannot be beaten. It is located in St Stephen’s Green, which is the equivalent of New York’s Central Park in Dublin. And if a park doesn’t really do it for you in terms of location? 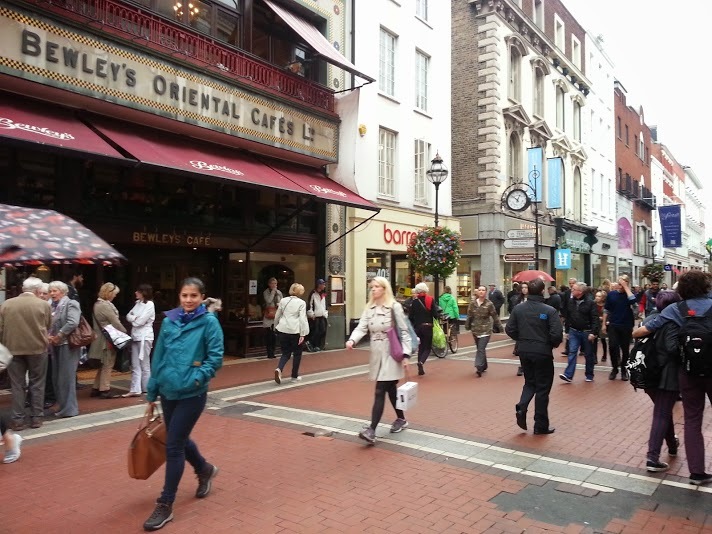 Let it be known that The Fitzwilliam Hotel Dublin is less than a minute’s walk to the city central for shopping, good food, and drinks (why there’s a pub every second store!) 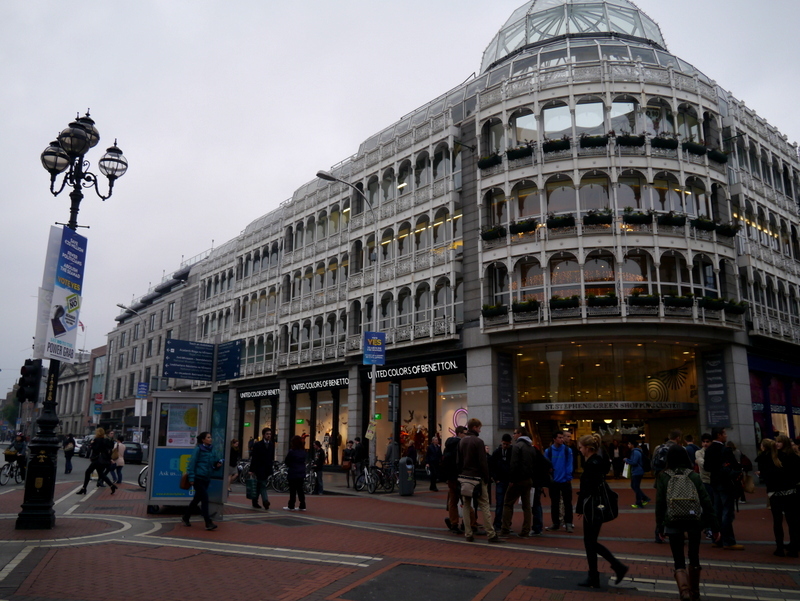 And it is next door to St Stephen Green’s mall. Oh, and did I mention that just round the corner is Trinity College, and St Ann’s Church of Ireland? 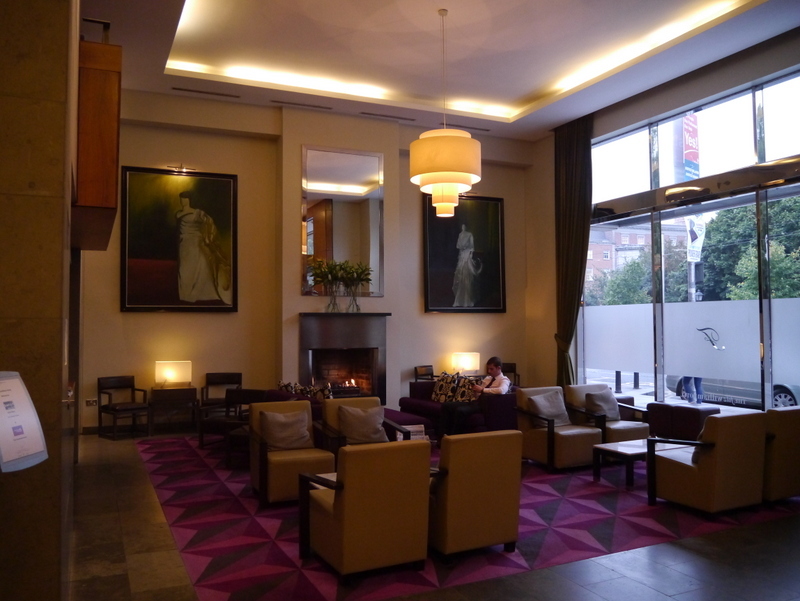 I cannot stress further how awesome the location of the Fitzwilliam Hotel Dublin is. This hotel is city central at its best. It was very nice to walk down the main street, hustling with the crowds, knowing that your hotel is situated nearby. As the hotel is situated right next to a busy road, it was quite a respite to step inside. The hotel was quite busy when we arrived, however we were accommodated as soon as possible. We arrived before 11 and I was pleasantly surprised to be advised that the room was ready (normally check in is 2pm). 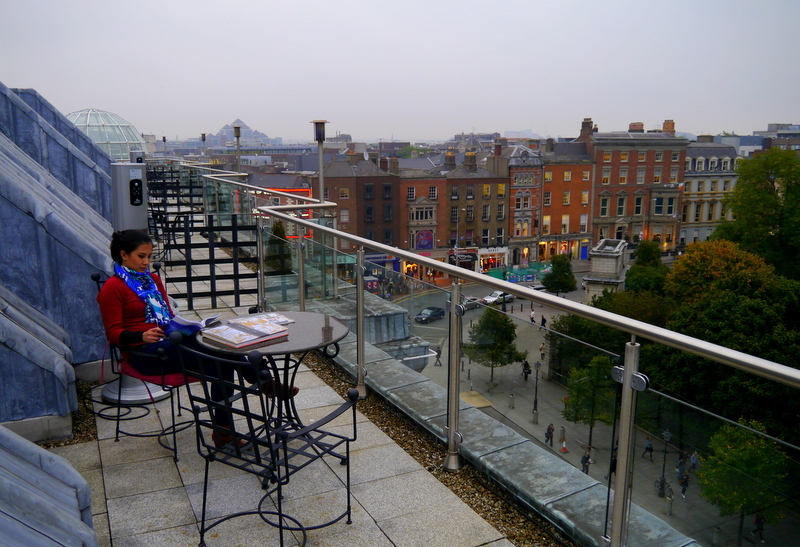 Rooftop Balcony at the Fitzwilliam Dublin Hotel: Perfect View of Dublin City Central! 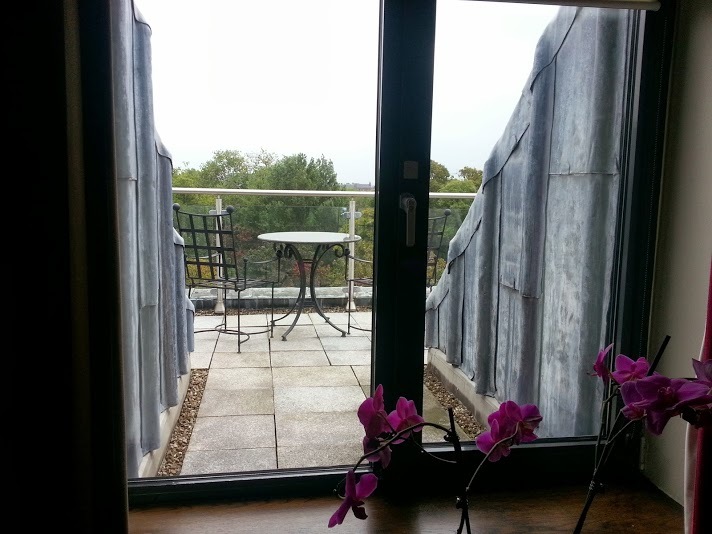 The perfect view of central Dublin right at the rooftop! There was also a heater, and this made working / reading in the balcony such a pleasant experience. The smallish in-room work desk is easily overlooked as this perfect outdoor working / lazing area more than makes up for it! What I did love inside the room though were the little touches such as, a big (purple of course) umbrella for guests to use. This is both smart and thoughtful as it rains most of the time in Dublin. Ring! Ring! A Vintage phone! I am hesitant to call this “vintage” because I still remember when all phones looked like this! 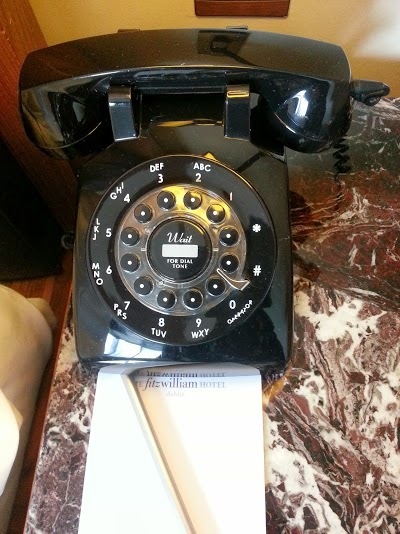 And I remember using a pen to lazily wind the dialing mechanism. 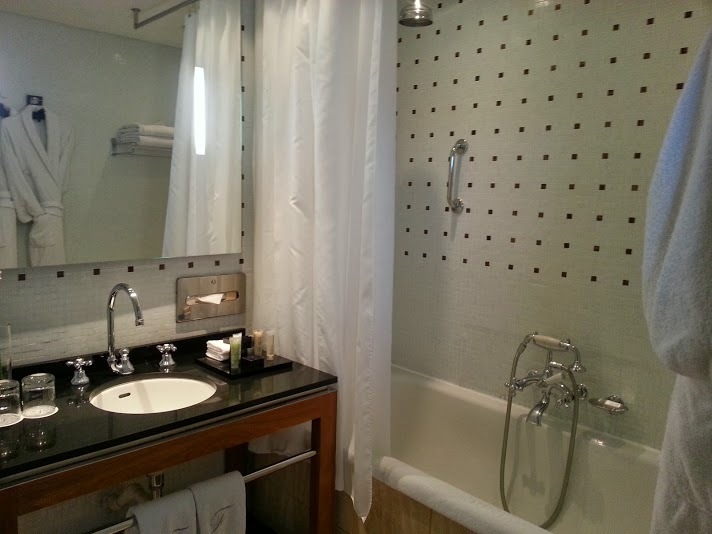 the hotel bathroom is Vintage-ly styled as well. Think Gatsby-ish! 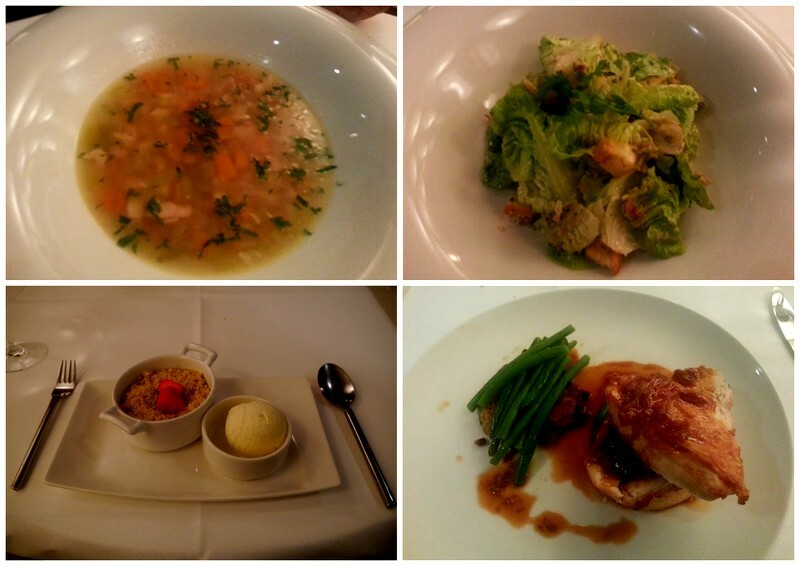 For our first dinner in Dublin, we dined at Citron Restaurant. 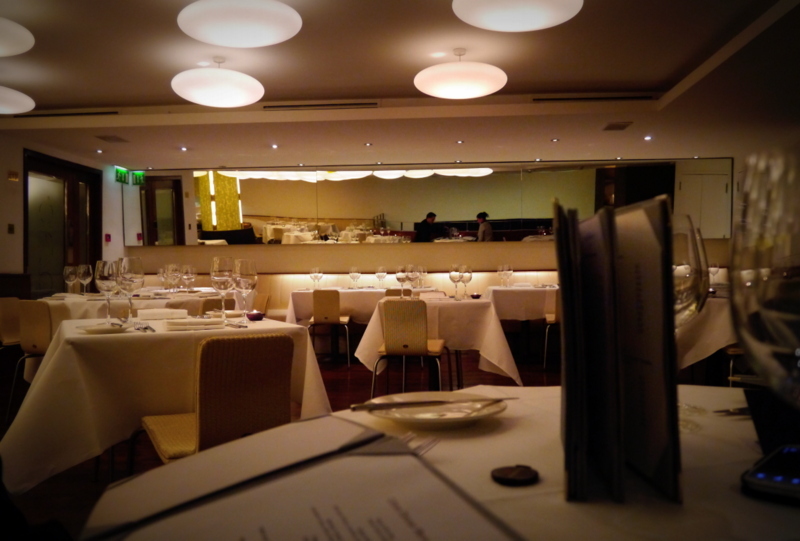 This is the Fitzwilliam Hotel Dublin’s in-house restaurant that was voted Best Hotel Restaurant of 2012. This dinner couldn’t have been more perfect. The weather in Dublin gave me abit of the sniffles so I had one of the best chicken broths ever (top left) , with other no-fail dinner classics which really brought such comfort. I loved the location of Citron Restaurant, you are sort of perched above the hotel reception so you do abit of ‘surveillance’ seeing people checking in and out. 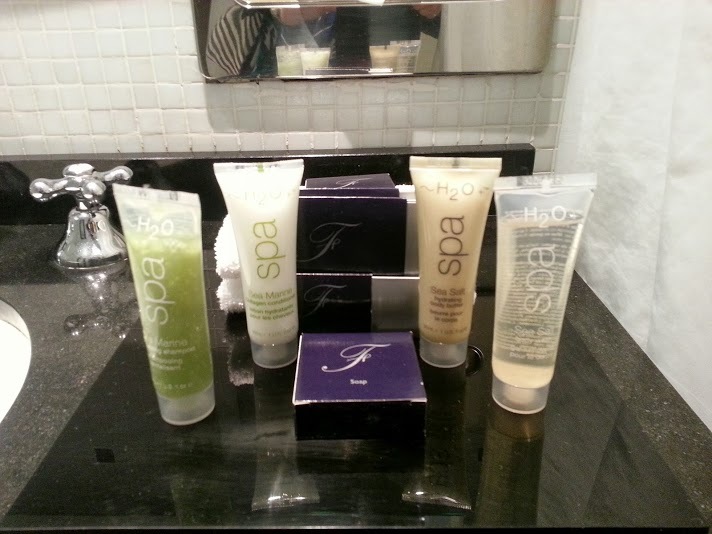 I would like to give a special mention on how accommodating the staff are at the business centre of the Fitzwilliam Hotel Dublin. On our flight from Singapore- Dublin via Abu Dhabi, I discovered that I left ALL my important documents (travel plus conference documents) in the aircraft! I had to re-print most of the documents, and despite another conference happening at the business centre level (so they were quite busy), the staff was ever so accommodating to ensure I had everything I needed. 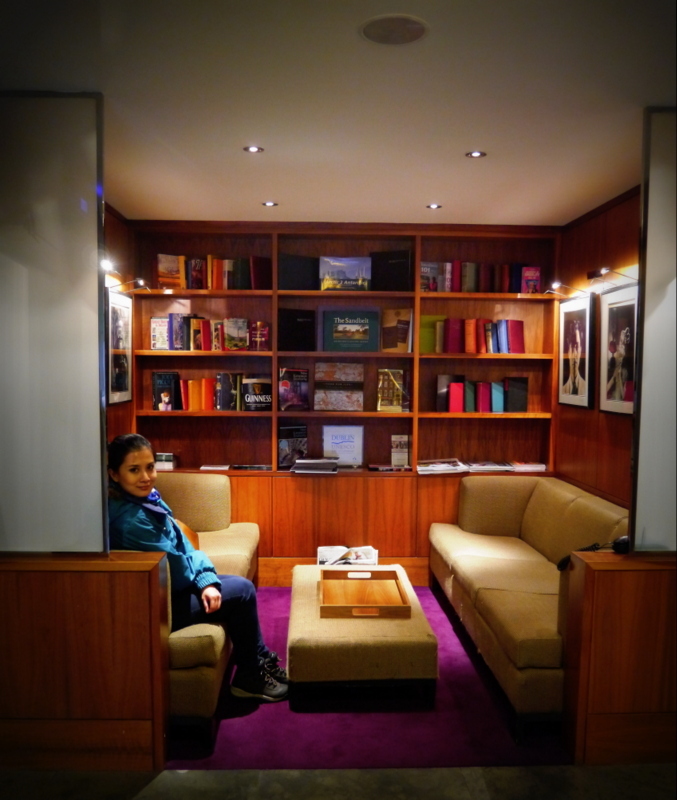 I cannot think of a better-situated hotel (in the same category) as the Fitzwilliam Hotel. The minor points are a small work desk and not enough powerplugs. But these are very minor issues compared to the customer service that they offer. This, and most of all the supreme location of the Fitzwilliam Hotel, makes me say that Yes, I will stay here once more when I need to be in central Dublin. 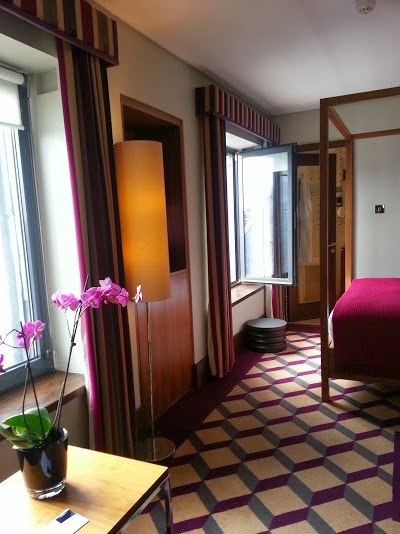 To book your stay at the Fitzwilliam Hotel Dublin, click Here.